Kinship Adoption: Is It for You? Considering Options in Adoption. Kinship Care: Is It for You? Posted on June 12, 2018 at 1:32 pm. As you think about your pregnancy options, have you considered kinship care, or family placement? Many expecting parents prefer to place their child in the care of someone they already know. While only you can decide what’s right for your family, we’re here to help you explore this option. The tradition of relatives helping raise a child has been around much longer than child welfare agencies. Kinship arrangements mean more than having an extra pair of hands to help with diaper changes or grocery trips, however. State and federal laws recognize kinship care as an official type of foster care. Ever since the Adoption Assistance and Child Welfare Act of 1980, relatives are the first to be given the choice of raising children whose parents cannot be the primary caregivers. As of September 2016, 32 percent of children in the foster care system were placed in foster homes with relatives. What some expecting parents don’t realize is that they can explore the option of kinship care before their baby is born, similar to the adoption process. Like adoption, kinship care can take many forms. Although the kinship care model typically means literal “kin” or family, it also can include a close friend who cares for your child. In some arrangements, the birth parents maintain legal custody of their child, with the kinship foster parents assuming physical custody and day-to-day parenting responsibilities. This type of agreement allows birth parents to still make decisions concerning their child. In other arrangements, kinship parents receive both legal and physical custody of the child. Kinship care is a common type of adoption for teenage birth parents. Often, it starts out as a temporary arrangement and becomes permanent if the relative chooses to adopt the child. Because some kinship arrangements start out informally, kinship parents don’t always receive the same recognition or support as other adoptive or foster parents. The needs and demands of kinship parenting are just as real, however. We encourage kinship parents to seek counseling and support services from experts who can help them care for themselves and their loved ones. 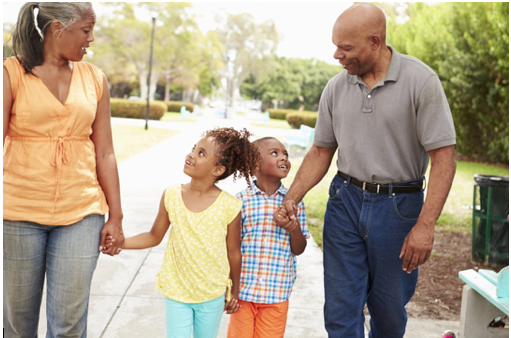 Kinship caregivers may also find assistance through national resources and state programs like the DC Child and Family Services Agency’s Grandparent Subsidy Program. Families can be complicated and messy, and they come with their own set of challenges. Similarly, placement of a child within a family comes with many special considerations. One of the most unique parts of kinship care is that the child’s kinship parent also has a personal connection with the birth parent. This can be comforting for older children entering kinship care, since they are going to live with someone they already know. On the other hand, these same ties can make it difficult for kinship caregivers to “own” the role of parent from the start. While it takes time, it is important for kinship parents to model stability around roles, routines and a sense of home to the children in their care. Another hurdle that kinship parents might not expect is the foster care system and its many policies and requirements — many have only the experience of raising their own children to guide them. And when kinship parents are the child’s grandparents, just the thought of raising a child in today’s era may be overwhelming. Support from experts and other families bonded by this unique type of arrangement can help kinship parents provide a stable home for the children they already know and love. If you’re thinking about placing your child permanently or temporarily with a relative and want to chat with a counselor, contact us anytime via email, text message, phone or by chatting with us online. You did a great job of explaining relative adoptions in this article. I didn’t know that over a quarter of the children in foster care system are placed in foster homes with their relatives. Personally, I feel this is the best option because parents would then be able to visit with their child while they work to stabilize their home life after a juvenile dependency hearing.